This is the year that you’re going to rein in your yard, and grow the best lawn you’ve ever had. You’ve been studying aeration and fertilizers, you’ve had your thatch inspected, placed your sprinklers, and had your sod installed… now what do you do when the grass starts to grow? How much water does a lawn in Colorado need? How often should it be mowed? Our watering instructions will help! Take control of your yard and get the best results possible with this lawn care guide from Longmont landscape and sprinkler system company Green Guys. Immediately after sod is laid and fertilized, begin watering all sodded areas. Schedule watering to assure the sod is constantly wet and water penetrates the soil 4 to 6 inches. This should continue for 10 to 12 days and until roots knit sod to the soil. The sod layer can easily dehydrate before roots are formed and severe damage can occur to your new lawn. Foot printing and/or the grass blades turning a blue-gray color indicate your sod is under dehydration stress and should be watered. Once the roots have knitted to the soil, sod should be watered every 2 to 4 days. However, the frequency and amount of watering depend on the soil type, root depth, topography of the land, natural precipitation, wind, temperature, humidity, and other environmental factors. It is best to apply water less often but at a rate that penetrates the soil 4 to 6 inches. Lesser amounts applied daily will cause shallow root growth and diminish drought resistance. Check with your sprinkler installer or manufacturer for precipitation rates to assure proper water application. Winter watering generally should be done every 3 to 4 weeks, depending on weather conditions. While mowing does wonders for the appearance of a lawn, it’s no comparison to what a proper mowing does for its general health and vigor. Only a sharp, properly adjusted mower set to a minimum of 2-1/2″ to 3″ in height should be used. Your first mowing should be after the sod has had time to knit with the soil. During rapid growing times it may be necessary to let the sod dry enough to permit mowing during the first three weeks. The first few mowings should be done with a rotary mower diagonal to the way the sod is laid. Subsequent mowing should be done whenever the grass clippings measure approximately 1/2″ or 25% of the grass plant. Never cut off more than 1/3 of the plant height at any one mowing. Removal of a greater amount of the plant may result in shock, unsightly appearance or susceptibility to disease. After the initial fertilization, Fertilizer should be applied as directed on the back of the bag during April, May, June, September and October with a cyclone-type spreader. Sweep all concrete areas that may have been pelleted with fertilizer before watering. Be sure to water thoroughly after each fertilizer application. 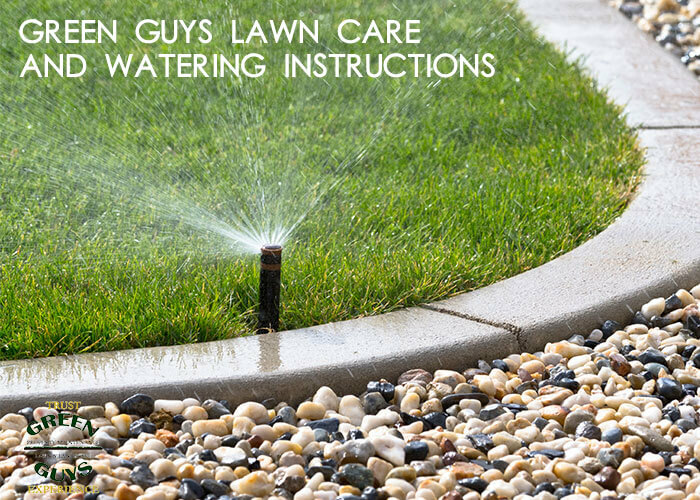 Download Green Guys Lawn Care and Watering Instructions Guide here!